It’s cold outside! The northern U.S. is experiencing subzero temps, and even temperate Oklahoma is blustery and chilly by February. What better way to treat your Valentine than to snuggle up in a cozy theatre and warm up with a love story. 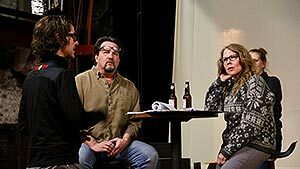 Actor and playwright John Cariani’s play Almost, Maine is the perfect show for just that. One of the most produced plays in the U.S., four thousand theatre companies have produced it so far, and it has surpassed A Midsummer Night’s Dream in high school productions. The play about the town that almost is and isn’t quite finds its perfect footing in Guthrie with The Pollard Theatre. The beauty of it, and what makes it so producible, is the simplicity of the story. 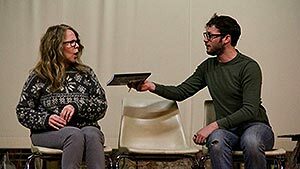 Presented in nine short scenes, the show focuses on the residents of a snowy, beatific town in Northern Maine called Almost. It’s not even a town, really, and the people who live there are finding love, in a way, but what they’re really finding is connection. It’s rich in conversational dialogue that feels comfortable and warm. As the townsfolk make realizations and new acquaintances, love is lost and found under the glow of the Northern Lights. Kris Schinske Wolfe and Jared Blount in The Pollard’s Almost, Maine. Every vignette in the show is a charming standalone scene. They’re individually named, making them effectively independent and freestanding plays themselves. Setting is the only thing they have in common, and the episodes do not intertwine. A few favorites include “They Fell”, “Getting it Back” and “Her Heart”. A new pair of characters appears in each of the nine segments. Romantic and sweet, this is a perfect date night show for couples. And even the skeptics won’t stand a chance against this lovely play. It’s that heartwarming. Though it may often feel that way, stage productions don’t just emerge fully formed from the set they’re built around. Rehearsal is where the real work is done and it’s not just fine tuning and memorization. Rehearsal is where something beautiful and moving is built, from the stage up, where there was nothing but empty floor before. OK Art Scene and Hurd was given an inside peek into a rehearsal session for Almost, Maine and it was educational as well as entertaining. Every move is deliberate on stage, so as to convey the correct language, further a story line, and develop the characters. The process is intricate, complicated, and so subtle it’s hardly noticed by an audience. But those decisions must be made, and this cast is committed. What results in the deliberate work of these fine actors is well-rounded characters that teem with real emotions and actions. Their movements match their story and they’re not just reciting lines. What’s written in black and white on paper scripts becomes full color on stage. Cast of Almost, Maine with production director Matthew Alvin Brown. The development of the onstage movement and placement of actors is fully detailed by the director, a part played in this production by Matthew Alvin Brown. Brown’s expertise and attention to even the most understated detail is what brings this play to life. Pollard patrons will recognize Brown from prior Pollard productions of Hedwig and the Angry Inch, Company, American Idiot, In the Heights, and Passing Strange. Timothy Stewart and Kris Schinske Wolfe in Almost, Maine. The nineteen roles in the show are played by Company members Timothy Stewart and Jared Blount, along with returning artists Kris Schinske Wolfe and Renee Krapff. Scenic and lighting design is by W. Jerome Stevenson, sound design by Jared Blount, and costume design by Michael James. Dakota Muckelrath serves as Stage Manager. Stewart has previously been seen in popular productions Hairspray, Sylvia, and It’s A Wonderful Life: A Live Radio Play. He’s also known as the beloved narrator in A Territorial Christmas Carol. Blount has recently been seen in Laughter on the 23rd Floor, The Producers, and Hedwig and the Angry Inch. Returning artist Kris Schinske Wolfe was most recently seen in It’s A Wonderful Life: A Live Radio Play as Violet Bick. Renee Krapff is known to Pollard audiences for her role in God of Carnage. 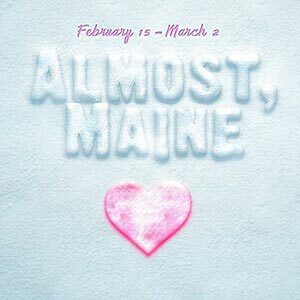 Almost, Maine, presented by The Pollard Theatre, runs February 15- March 2nd. For tickets, call the box office at 405-282-2800 or visit thepollard.org. The Pollard’s BOGO Event is Saturday February 2nd. Buy 2 tickets ONLINE for any performance (February 15th – March 2nd) and pay only $40! And also receive a FREE Pollard Signature Chocolate!